Partysaurus Rex may have been released on September 14, 2012, but it continues to be one of our most beloved Toy Story Toons — and it appears that we're not alone as Rex got suited-up in his 'bathtime party gear' again for Disney's H2O Glow Nights at Typhoon Lagoon. Recently, director Mark Walsh visited Disney World to see firsthand how the Toy Story Toon he and his team created inspired the newly themed party. "I am so proud of the team that made 'Partysaurus Rex'" gushed Walsh. "I had the most fun making it. I never thought that after all these years 'Partysaurus Rex' would still be alive and well, and even like a mascot or an icon for young people, for partying and having a good time being yourself — for me, that's really unexpected and really, really gratifying." If you have been a reader of our site, you know that we love to create our own custom Pixar merchandise, and it all started with Partysaurus Rex. From taking our custom Partysaurus Rex toy on numerous adventures, (including meeting BT who created the soundtrack for the film) to creating additional Partysaurus Rex gear — we just couldn't (and can't) get enough. We are so thrilled for Mark and the entire (former) Pixar Canada team to have made a story which is carried on at a Disney Park. Inspired by Pixar's Toy Story Toon, Partysaurs Rex, Disney's Typhoon Lagoon will transform into a glow party complete with special lighting effects, as Buzz, Woody and Jessie throw a Beach Party —complete with dancing and party games. In addition to the Beach Party, all attractions in the park will be open for guest enjoyment. The Disney H2O Glow Nights will be held on Thursdays and Saturdays from June 21-August 11, from 8-11 PM. Similar to other special events at the Walt Disney World Resort, Disney H2O Glow Nights are a separately ticketed event (not included in daytime admission or with Park Hopper). Tickets: Adults-$55, and Children (3-9)-$50 (plus tax). For additional information and to purchase tickets visit the official Disney website or call (407) 939-1872. - Ever Wonder How We Made Our Custom PartySaurus Rex? Watch This Video! 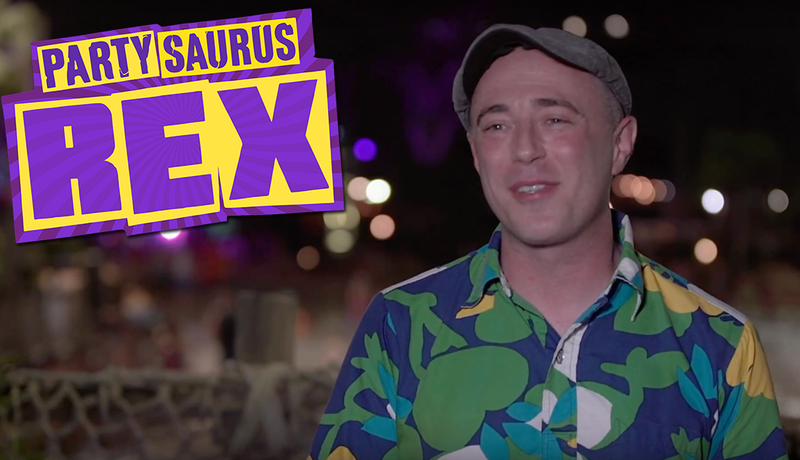 Watch 'Partysaurus Rex' director, Mark Walsh, share his admiration for the film while attending Disney's H2O Glow Nights themed after the Toy Story Toon, and Rex!